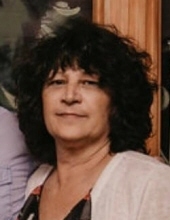 Annette L. Schuett, 59, beloved wife of Fred, Jr.; loving mother of Amanda (Ben) Gibson and Fred III. ; cherished daughter of Joseph Allessi and Bernice O'Bradovich; fond sister of Georgette (Richard) Roberge, Joseph Allessi, Nicolette (Jim) Haubner and Michael (Laura) Allessi; dear aunt of nieces and nephews; Doggie Grandma of Paulee, Marley, Dakota and Sadie; Cat Momma of Cherokee and the late Sylvester. Visitation Wednesday, December 5th. from 3-8 P.M. at Petkus-Lemont Funeral Home 12401 S. Archer Rd. (Corner of Archer and Derby Rd.) Lemont. A private cremation will be accorded the following day. For additional information, contact Suburban Family Funeral Home at 708-652-1116 or Petkus-Lemont Funeral Home at 800-994-7600. To send flowers or a remembrance gift to the family of Annette L. Schuett, please visit our Tribute Store. A private cremation will take place on Thursday, December 6, 2018. "Email Address" would like to share the life celebration of Annette L. Schuett. Click on the "link" to go to share a favorite memory or leave a condolence message for the family.